We’re delighted to announce that we have been asked to perform as the support act to The Wurzels as part of the Falmouth Week entertainment program which also includes The Craig Charles Funk & Soul Club, Go West, Jethro and Leo Sayer. It’s a great opportunity for us following on from a fantastic weekend at The Falmouth International Shanty Festival where according to the organisers, we “went down a storm”. 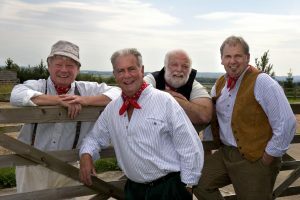 With an estimated audience of at least 1000 people, we are really looking forward to the 12th August and a Wurzels audience will hopefully appreciate our kind of music.